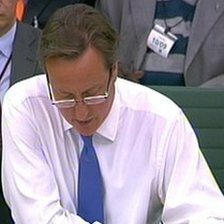 Taking to social-networking site Twitter, David Cameron revealed he had been wearing them for three months. He had been facing questions from the Commons Liaison Committee, which brings together the chairmen and chairwomen of the main select committees. The prime minister – once described as the “heir to Blair” – followed in the footsteps of the former Labour leader. In 1999, a “self-conscious” Tony Blair revealed he had hidden the fact he had needed glasses for months. Westminster leaders Margaret Thatcher, Neil Kinnock, Paddy Ashdown and John Major all wore glasses while in charge of their parties.